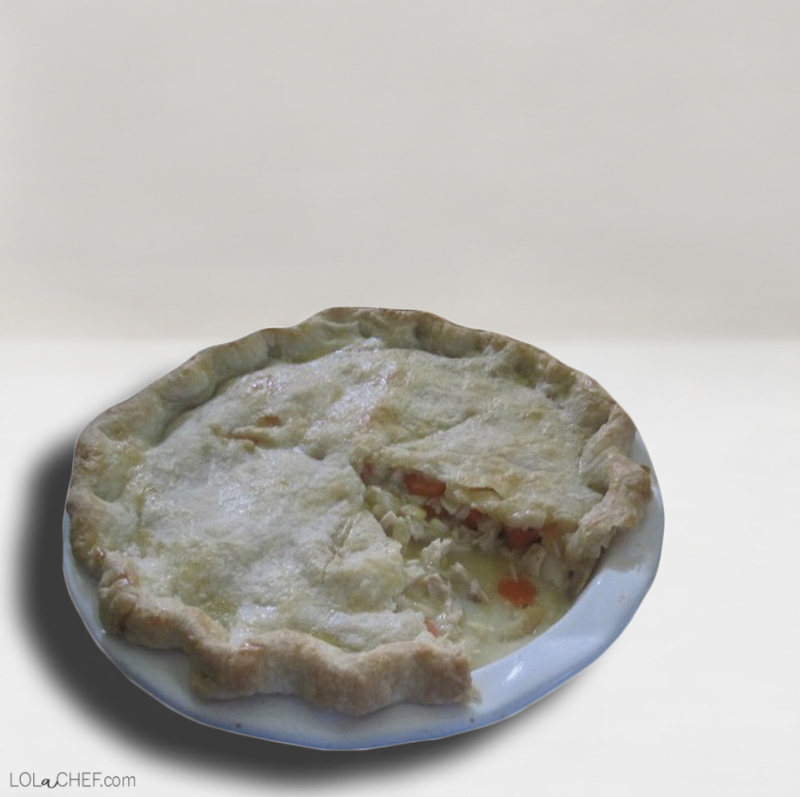 I can’t think of a better comfort food than a good homemade chicken pot pie. I think I like it because it’s technically a pie and it feels like eating dessert for dinner 🙂 Dessert for dinner is almost as good as breakfast for dinner. I make my own crust, that way I can add a dash of sugar and make it a little sweet…..just a little. Not too much though. My daughter Lola (aka:Lolachef) was helping me one day. I turned around and she dumped a cup of sugar in the crust dough. She mixed it up well and I didn’t notice. After we all took a bite at dinner we all looked at each other…..hmmm tastes kinda funny. Lola grinned, proud of her secret addition. We got through it, but will always remember that way too much sugar is…..yuck! For this recipe I encourage you to try to use freshest ingredients you can find. If you have some leftover chicken soup or stock it’s perfect for this recipe. If you don’t, use a good store bought brand. If you have a few cups of flour and some butter at the house, try to make a dough. If not, you can use store bought. It’s still better to make it yourself than to buy it already processed. Try making one of the ingredients yourself first, then try more the next time. 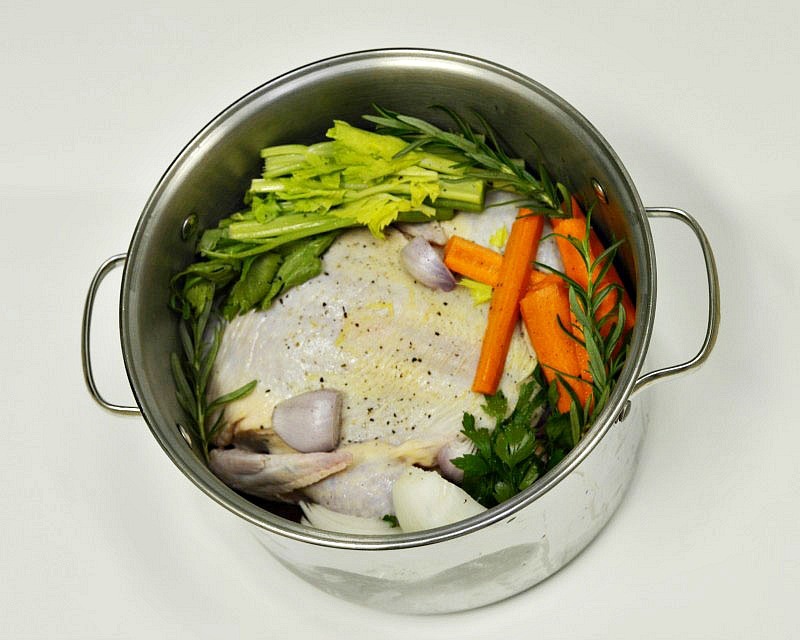 It is easier to make a chicken stock ahead of time and freeze in batches for when you need it. See my easy recipe here. Sometimes I like to make this recipe as a soup and put it in a bread bowl, especially a homemade bread bowl. 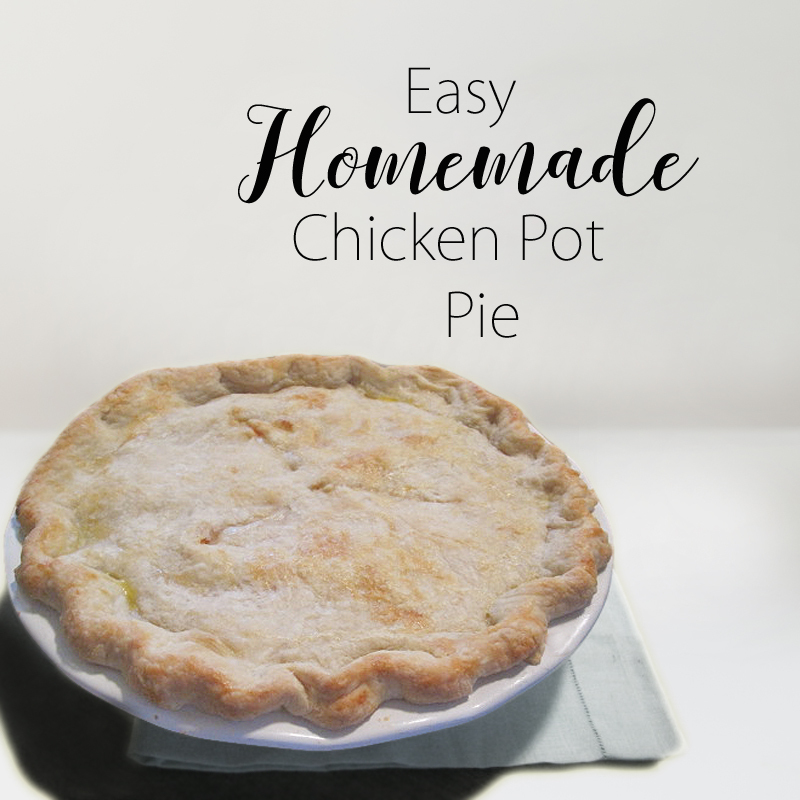 Classic chicken pot pie is usually made with peas and carrots. Peas do not fly in this house, so carrots and corn is my go to. You can add peas or green beans, or whatever you want. I like to make variations around the holidays using turkey, cranberries and left over green bean casserole. You don’t have to use two pie crusts either. A lot of times I just pour the pot pie mixture in a pie pan and simply cover with a thick layer of the dough. That is a lot easier and all the crust is crispy. If the crust if your favorite part, You can put filling in a 9 x 12 rectangular glass baking pan filled about halfway to the top. Then use both pie crusts together and roll out to one large rectangle that is enough to cover the top. Now you have more of the crispy crust and possibly enough for leftovers. A smooth rolling pin without handles will help you keep and evenly rolled out crust. A marble or wood one will work great, but a stainless will help so the dough won’t stick. I use a marble slab on my counter when rolling pie crust, it is cool and when rolling dough……cool temperature is your friend. Chill pie crust. Have chicken cooked, cooled and ready for the pot pie. In a large pot, melt butter and add diced onions. Cook onions on medium/low heat for a few minutes. Add flour and whisk and continue to simmer on low for a few more minutes. Add chicken stock, milk, chicken, and vegetables bring to a boil, then reduce heat to a simmer. You want to cook until carrots are soft. Continue to stir and add salt, pepper, and seasonings to taste. Once carrots are soft and the mixture is to your liking, turn off heat. On a floured surface, roll out pie crust. Place one pie crust on a clean pie pan leaving enough on edges to fold in with the top layer. Add chicken pot pie mixture to pie crust in pan. Add the top layer of crust dough. Connect the sides by pinches the top and bottom layers together and then fold together and form the sides anyway you want. Crack an egg in a small cup or bowl, add a splash of milk and whisk. Spread this over the top of the crust. Using a knife, slice a few air holes in the top of the pie dough. You want to cook this at 425 for about 25-30 minutes or until top is golden brown and the mixture is bubbly. I usually place a pan larger than the pie pan underneath the pan to catch any drippings that may drip out. Once the pot pie is done and is a nice golden brown, take out of the oven and let cool for a few minutes. Cut into slices and enjoy! I have to say that growing up I hated pot pie. That was until I tried to make it from scratch for the first time. Hairbie requested it when we were first married because I wouldn’t let him buy the frozen version. I knocked a lot of frozen food out of his hand in the grocery store over the years. I told him to try my homemade version first. Then I was stuck making one, so I did. One day I had some leftover chicken soup in the fridge and decided to give it a try. I was intimidated at first, but it worked and tasted great. What a difference when you make it homemade. What do you think? Have you tried homemade versus store bought?